How Does Spray Foam Insulation Positively Affect the Environment? Spray foam insulation delivers high-performance solutions for efficient building envelopes, thermal comfort and a healthy indoor environment – all of which are integral components of green building in Johnson City, TN. Icynene’s products are 100% water blown. They do not contain synthetic blowing agents such as HFCs that are often used in other spray foam products and are considered to have very high Global Warming Potential (GWP) gases. Icynene spray foam products contain no PBDEs. This is considered a harmful flame retardant that can compromise the health of building occupants. Icynene is a Class 1 fire rated product without the use of PBDEs. Superior air-sealing capabilities. Icynene locks out dust, allergens and pollutants from entering the building creating a healthier indoor environment. 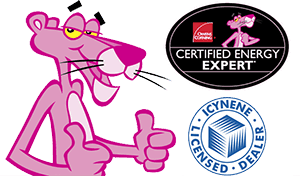 Creating a superior air-seal in just one step, Icynene also minimizes the use of excess sealing materials which would otherwise be required when using conventional insulation such as fiberglass. Foam insulation offers up to 50% energy savings. In turn, it helps reduce the production of greenhouse gases like Carbon Dioxide by thousands of tones a year. Real R-value. Spray foam insulation maintains its performance (doesn’t sag or settle) with no loss of R-value over time. It provides total thermal comfort today and for years to come, while conventional insulation can deteriorate as time passes and may no longer perform as it did when initially installed. Selecting products that provide longevity, like Icynene, can potentially eliminate the need for the installation/re-installation of additional material in the future.